The mango tree is full of fruits this summer! Mama and Kuya Bernard are very happy. 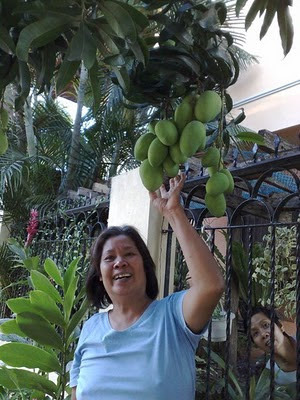 One afternoon they were picking mangoes and Mama asked me to take her photo. 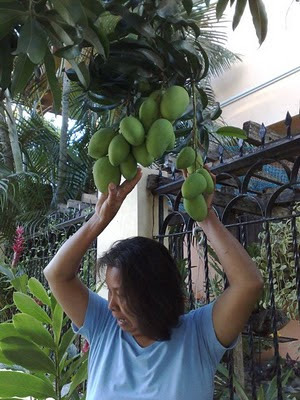 She posed under the fruits, with her hands touching some of the mangoes. 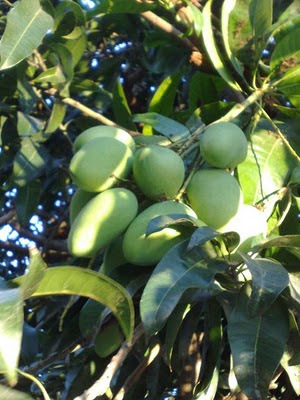 Then, the mangoes started to fall off the tree! These mangoes will turn yellow once placed in the fruits basket. I want to get away! I have been trying to be positive especially I am expecting but I just can't take it anymore, I want to escape with my baby in tow. We'd go somewhere peaceful with lots of water, birds, and blue skies. The first thing I did this morning was to filter all my emails, remove people from my networks, and now I plan to not give a damn about stupid people and their stupid actions. All I will think of is delivering my baby. Stupid people including women who are so desperate of men clinging to someone who is about to have a son are putting me in danger. I am so stressed out and tired that I had bloody discharge several times yesterday. I wouldn't care about you, about our stupid router that won't work with my gadgets, and you who don't know how to use your brains. I can't wait to deliver, go to work, and give my son a great future with or without anybody's help.